Inscribed on the back of the original canvas “For Mr Ford”. 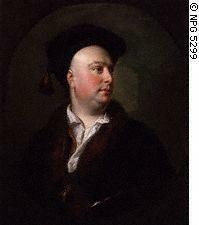 We have not yet traced the identity of “Mr Ford”, though it way well be a reference to the Irish portraitist and engraver Michael Ford (d.1765) who was in London for an extended period before his return to Dublin in 1742, and who is documented as engraving portraits after Hogarth, Cotes, Hudson, Arthur Pond et al..
All of these pictures share a delightful and relaxed informality far removed from the dull Augustan pomp which suffuses so much of Georgian painting before 1750. 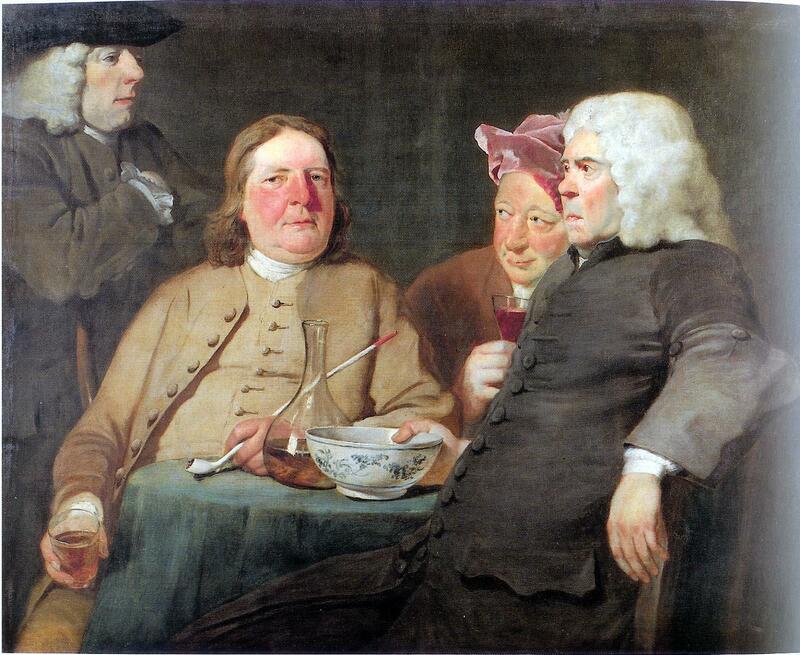 They all seem to share the same intimate relationship between the sitters and the artist (indeed, Highmore paints himself as the second figure from the right in that painting). It seems certain that the two figures in our painting are artists, since the table is strewn with papers which seem to be sketches on blue paper of a female figure subject (? The Three Graces) and a mezzotint portrait in oval. 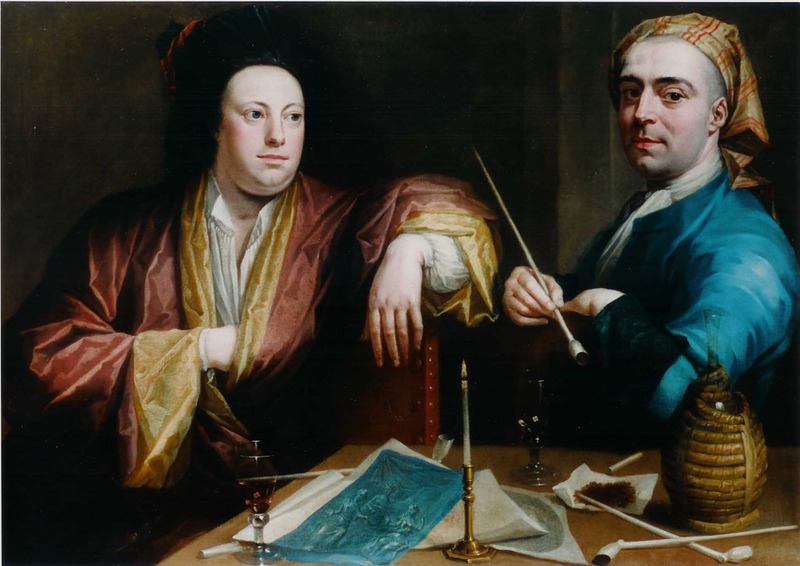 The figure on the right holds a pipe, but this appears to be a pentimento covering a paint-brush; the direct gaze of this subject looks remarkably like a self-portrait taken in a mirror. The handling of the silk and satin drapery is particularly well handled, and it is perhaps this which most suggests that this is a self-portrait by Joseph van Aken, who worked as a drapery painter for most of the major London portrait painters of the day, perhaps most notably Thomas Hudson and Allan Ramsay, who were executors when he died in 1749. Likewise, the drawing on blue paper calls to mind the technique of the compositional drawings, now in the National Gallery, Edinburgh, which were executed by Van Aken in the 1740’s. Van Aken was probably born in Antwerp in 1699 and first came to London with his brothers c.1720. Initially he painted genre scenes of a type popularised by J J Horemans. From about 1735 onwards he specialised in painting the drapery for famous and fashionable London portraitists, though occasionally he still produced ravishing conversation pieces of country scenes of a sporting nature. When he died in 1749 (“of a feavour” according to Vertue) Allan Ramsay and Thomas Hudson, the leading portraitists of the day, acted as his executors, and for whom he worked as drapery painter on very many commissions. 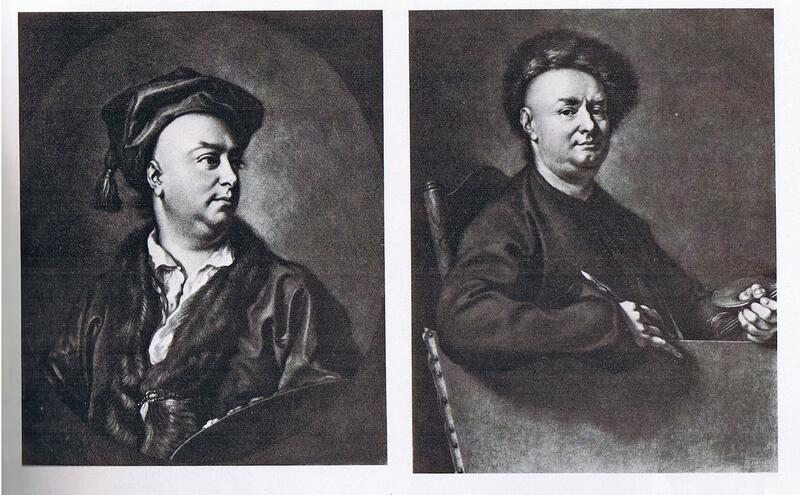 J Faber after T Hudson: Alexander van Aken and Joseph van Aken (dated 1748 and c.1748).